​Below you'll find a collection of ready-to-use resources for your practice, staff, and patients. Overviews, benefits, dispensing tips, and availability for all products in the SunSync portfolio. 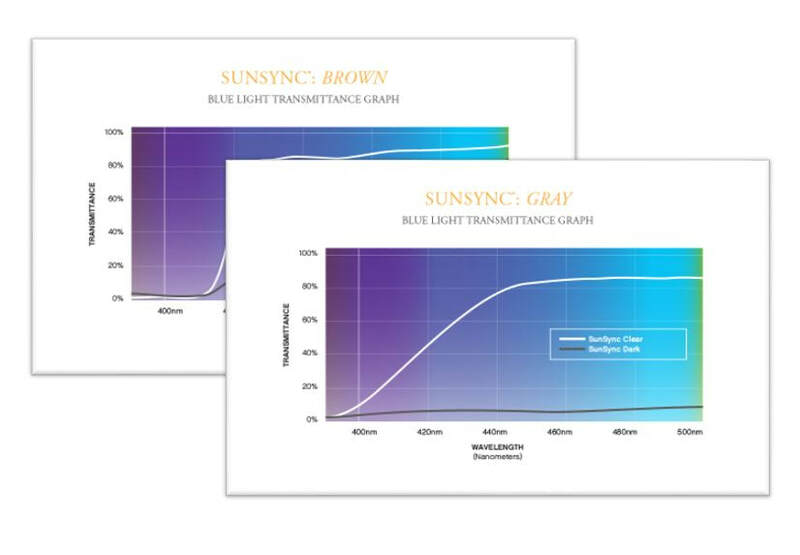 View blue light filtration graphs for SunSync Light-Reactive Lenses in clear and dark states. ​SunSync Elite waiting room video. Give your patients a quick introduction to the benefits SunSync Light-Reactive Lenses while they're waiting for their appointment. Share these graphics from your preferred platform to let your patients know you can offer them fade back in seconds. Print and display this infographic to inform your patients of the factors that increase UV exposure. Offer a glimpse of what SunSync Drive XT looks like indoors, outdoors, and behind the wheel, and how clear and dark it gets in each environment. Receive SunSync's monthly e-newsletter to stay updated on new product launches, CE opportunities, free resources, and more.